Johnny Bohmer has been breaking records in his 2,700 horsepower BADD GT for a while now, first taking it to 250 mph before going up to 275 mph and, then, 283.232 mph, which still stands as the Guinness World Record. 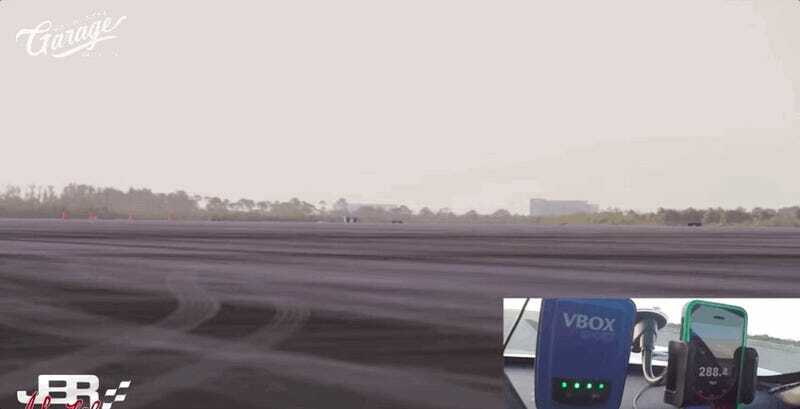 On Friday, Bohmer beat that, going 292 mph at the Kennedy Space Center in Florida, though coming back down to zero turned out to be the hardest part. Bohmer’s original plan was to try and top 300 mph, but he lost some boost pressure once he got into 6th gear, so he had to settle for 292. More harrowing was stopping since, as you can see in the video below, his parachute ripped into two pieces as it deployed. What happened next? A hard brake, which Bohmer told me, put cracks into the rear rotors. “When I stopped I thought the car was on fire,” he said. The car was not on fire. But the wheels were very, very hot, and Bohmer said he was just happy he was on a long enough track, or things really could have gone south. While 292 mph is faster than 283.232, Bohmer did not break the Guinness World Record for a street-legal car because the Guinness people weren’t on hand to certify it. He says they’re pretty serious, too, requiring the car to have air-conditioning that can cool to 60 degrees and the ability to drive for 15 minutes prior to the record attempt, in addition to the normal things, like valid license plates, insurance, and so on, all of which the BADD GT complies with. Still, the official Guinness record is less important to Bohmer than actually just surpassing the 300 mph mark. Bohmer says he’ll try again for it in December, when Fast N’ Loud, a Discovery Channel show, will come to film his next attempt. Bohmer has tuned the car to go 318, but he thinks a more realistic number is 309 or 310. He’d be happy just to break 300 though, in a car that at this point is Bohmer’s baby. “It’s a pure, raw, serious street car,” he said.